Are ICOs causing Ethereum to fall in price? Ethereum is still tanking and many point to poor sentiment and short trading; one thing is for sure, ICO sell-offs certainly isn't helping. Since May we have seen an unfortunate reversal for Ethereum that hasn’t stopped thus far. 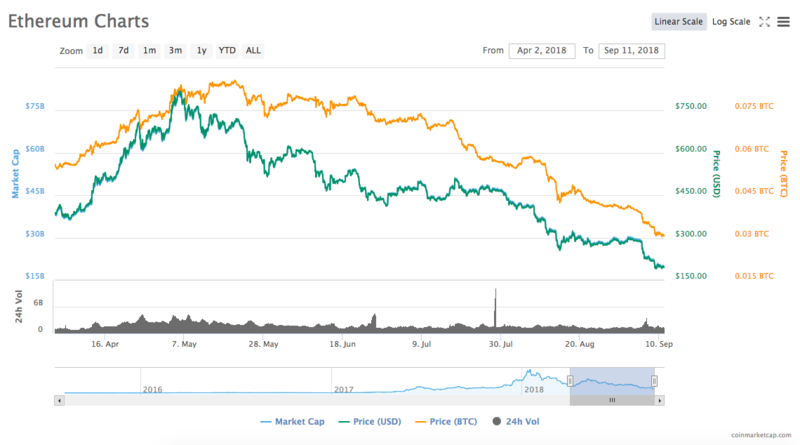 This dramatic reversal is fairly typical of most cryptocurrencies at present, but ETH seems to be taking a particularly hard beating. In the past week alone ETH is down almost 33%, but why? Some point to the rise in short positions which recently reached an all-time high, with hacked reporting that Bitfinex alone holds 208,689 short positions. Breaking the previous record by approximately 5000. Bitmex’s introduction of the ETH perpetual swap also shares the blame which allows shorts with up to 100x leverage. One person pointed out that since the start of these contracts in august ETH had fallen by around 57%. ICOs have spent over $30 million worth of ETH this week (153,500 ETH). This is more than any week since March 2018. The scary part? These ICOs still have over $600,000,000 worth of treasury ETH in their accounts (3,000,000+ ETH). It is perhaps understandable that projects which raised money at the top of ETH’s peak are tired of seeing their profits dwindle and wish to escape any more pain. Unfortunately for the rest – hodlers and projects alike – a further sell-off won't help ease the pain. Biswa Das a crypto hudge fund manager shared a similar sentiment when he spoke to Bloomberg of these ICO dumps. However, he argued that in the long term this is potential to recover as long as demand to build projects on the Ethereum network holds. Unfortunately, it seems this is somewhat unlikely in the short term; a recent report by GreySpark Partners observed that half of all ICOs launched since 2014 failed to raise any money. There is still hope, that these diminishing returns could potentially be rectified once the highly anticipated institutional money fully enters the fray. Are you going to sell off ETH, or buy the dip?